This month I joined the Improv Challenge. As a participant, you have to make something that will include two ingredients the same for everyone. This month the ingredients are lemon and sour cream. 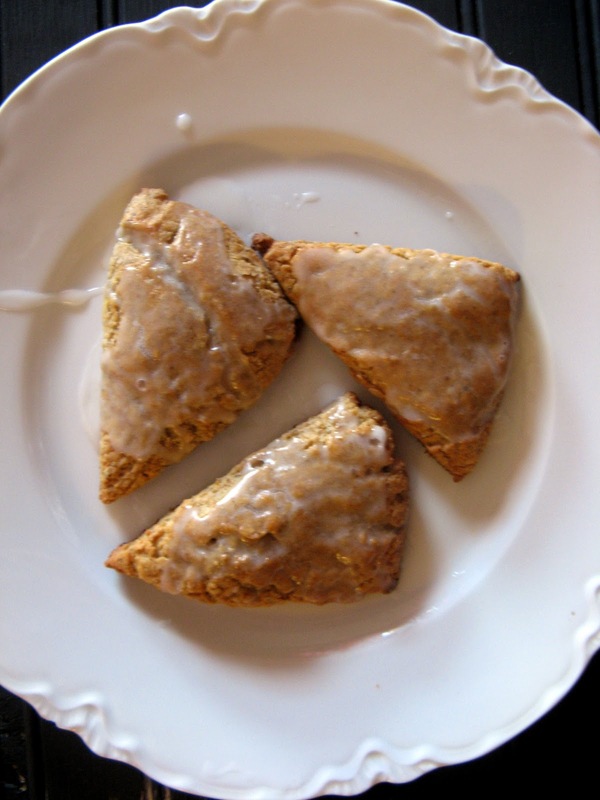 As I am looking for healthy and satisfying breakfasts this month, I decided on making scones. Did you know that with just one lemon you can make yummy, refreshing scones? Perfect for this season, when we are trying to enjoy citrus fruits. I slightly changed this recipe. Mix sour cream and baking soda in a small measuring cup. Set aside. In a large mixing bowl, whisk all dry ingredients together ( flour, sugar, baking powder, soda, salt and nutmeg ). Add butter and cut it in using a pastry cutter. Add enough milk to sour cream and soda mixture to make 1/2 cup of liquid. Add sour cream and milk mixture, egg and the zest to your dry ingredients and stir gently until just combined. Place the dough onto a lightly floured surface, divide into two parts. Flatten each one into a disk, about 1/2 inch thick. Cut in half and then each piece in half again and again. You should have 8 scones. Place them all on a parchment paper-lined baking sheet. Repeat for the second disk. Now you should have 16 scones nicely placed on a baking sheet. Place the baking sheet into the refrigerator, preferably overnight, or at least 30 minutes. When ready, preheat the oven to 425 degrees. Bake the scones for 13 – 15 minutes for the 30-minute refrigerated ones, or 15 – 18 minutes for the overnight refrigerated ones. Whisk it all together until smooth. Glaze cooled scones. There you go: a citrus – fresh breakfast, ideal for January morning! I love to cook, but baking is a challenge. i made these yesterday using your recipe. I have to find a good hiding space to keep them away from my bride. They are wonderful. I just have one question – when do you add the lemon zest? I assumed with the milk, sour cream and egg mixture. Is that right? I figured I had it right, because it was so good! I am so happy you like them! 🙂 Thank you so much for letting me know, Richard! Ideal indeed! Those scones look amazing! Hi Nadia! Thank you so much and welcome to CCS! Love this recipe! The lemon glaze sounds extra delicious. I love scones & those sound fabulous! Love the idea of using sour cream in them! Yum! I've never made scones with sour cream before, these look delicious! I hope you will try them – it's worth it! Thank you for stopping by! Your scones look amazing – what a fabulous pick for the challenge! Hi Cathy! Yes, the glaze fits the scones perfectly. Thank you for visiting! YUM! 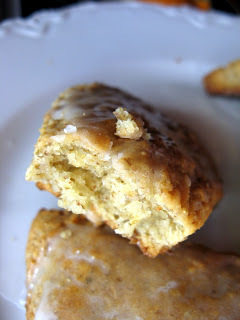 I like that the sour cream is in the scones (nice tang and moisture), but LEMON GLAZE? Super YUM! Oh Yes! This is delicious! By the way – thanks for the up date that Jan. Is citrus month. Can't wait to try your orange carrot bread! You welcome, Lindsey 🙂 Please, let me know how you like the bread. Thank you for visiting! Wow these look lovely. The Lemon Glaze is a brilliant idea. Thank you so much, Sas! Thanks for visiting! These sound delicious! I should try using sour cream in a scone, it must make them very tender! 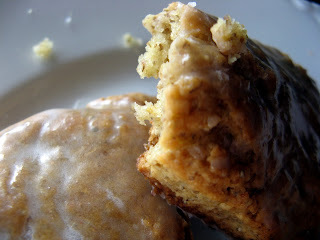 The lemon glaze is the perfect finish! Hi Amy! I wasn't sure how it will come out but they scones were perfect! They are tender and the glaze just makes you happy 😀 Thanks for visiting! I am so glad to see scones in this collection. That glaze just sends them over the top. What a happy way to start the day with those yummy treats. Thank you, Kristen! For organizing and running the challenge – I had so much fun this month! Thank you for stopping by my post! 🙂 Hugs! These would be perfect with my morning cup of coffee! They are! Thank you, Val! Yum! They look delicious. Great choice! Thank you so much, Lesa! They look great! I love the lemon glaze! Yeah, they are quite handsome little devils 😀 Thank you and welcome to CCS, Dorothy! Thank you so much, Anne! I just might start using sour cream in my scones from now on. Thank you! Hugs! I love scones and these look great! Stopping by from the Challenge–isn't this fun!? Totally!! I am so glad I joined this month 😀 Thank you for stopping by, Ashley! Scones are one of my favorite breakfast (or snack) treats and yours look delicious. So do the other recipes you have here on your blog! I have had a great time perusing your latest posts! Yum! These look good. I've not used sour cream in scones before. I think I'll try this! Please, do! They will make you happy 🙂 Thank you so much for visiting! Me too, Kiri! Thank you so much for stopping by! Your scones look wonderful!I love the glaze on top! Thanks for stopping by, following me, and leaving such a sweet message on my blog. I am now a follower of you. Glad you are with the Improv Challenge! Thank you so much, Teri! Welcome to CCS! I have never made scones before. May have to try. Look really good! Yay! Thank you so much and welcome! I'll have coffee with mine. Thank you, Jen! Welcome to CCS! These scones look so toasty and delicious with that glaze on them. I would have loved to seen them on the table this morning. Glad you participated in the challenge, or else we never would have seen these-yum! I had fun indeed 🙂 Thank you, Tina! Hugs! Those look so delish! I can never say “no” to scones! You got me for citrus glaze on these lovely scones. Thank you so much, Balvinder! That glaze must make it extra lemony. Looks delicious. I promise – the flavors are quite balanced. Thank you for stopping by, Chaya! seriously though! do you? =) haha these look beautiful!!!! lemon anything rocks my socks! You are so sweet Jenn! lol Thank you! Hugs!